The Ardennes campaign for the U.S. Army began on December 16, 1944 with a surprise and massive German offensive under Gen. Von Runstedt along a 45 mile front some 35 miles West of the Rhine River and due West of the German cities of Cologne, Hamm, and Koblenz and following the same routes through Luxembourg and Belgium taken by the German armies in 1914 and again in 1940. The Allied command had left that area thinly defended by four American Divisions – the 99th, 4th, 28th and 106th – the latter just arrived on the line fresh from the States and not yet battle tested. Add to these a part of the 9th Armored Division and the 14th Cavalry Group. Imagine the surprise to these Americans when without warning, this quiet sector erupted in the pre-dawn with an hour and a half barrage from all types of artillery, then search lights through the morning fog, then coming through that haze all along the sector tanks and infantry from 24 German Panzer and infantry divisions. Within hours the 106th was overrun and destroyed, some 6,000 G.I.s taken prisoner, the other units, badly mauled, were drive back in confusion, split into small groups, isolated, fighting small individual battles, to try to stop or slow the German onslaught. They faced some 970 Panzer tanks and 800 Luftwaffe planes which for several days penetrated through the mists and clouds which covered the battlefields. Allied communications were badly disrupted and battle reports distorted or not coming back at all, creating confusion and uncertainties in all headquarters. For the 35th Division, some fifty miles to the South, and bent on continuing its attack inside of Germany, little was known about what the rest of the 3rd Army was doing, let alone what was happening in the First Army whose VIIIth Corps had been hit so hard. But rumors spread fast, like wildfire, in an army, and we learned quickly that a major German offensive had broken through in the North, with Germans in American uniforms and using American equipment infiltrating or dropping behind our lines. Rumors quickly became reports as on December 19th our own offensive was abruptly cut off and all along our front we went into a defense, and three days later our trucks loaded us and we soon arrived in rapidly deteriorating winter weather in Metz, pulling up into a French army barracks, there to receive brand new replacements and replacement equipment and new rumors. The Germans had been pouring tanks and infantry through the breaches in the American lines. The 101st Airborne Division had been rushed in trucks to Bastogne, a Belgian communication and road center about 22 miles North of Arlon, a town some 35 miles North of Metz. Bastogne was about 80 miles southeast of Brussels and near the Luxembourg border, and a key objective in the southern part of the Bulge. Parts of the 9th and 10th U.S. Armored Divisions were in Bastogne and with the 101st Airborne troops were on December 21st completely surrounded by the Panzer Lehr and the 26th Volksgrenadier Division of the German Fifth Army, along with the 2nd Panzer Division. Gen. George Patton was ordered to counter attack with units from this Third Army and he quickly transferred the 35th Division to the Third Corps along with the 4th Armored Division and the 26th Division. And on the 23rd of December sent these three divisions to attack the German lines South of Bastogne, and along the Arlon Highway with the mission of breaking through to the Bastogne defenders and securing that corridor. 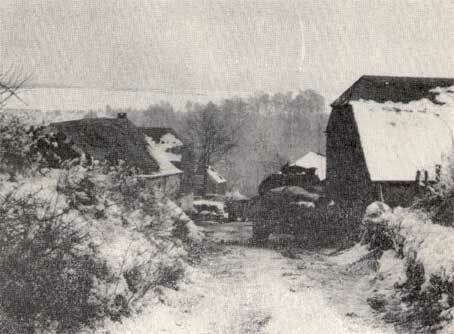 The 35th Division got two more days including Christmas Day in Metz to get ready to join the attack. The 4th Armored Division moved North along and to the West of the Arlon Highway, against determined German resistance, finally breaking through to Bastogne on the 26th. To secure the corridor, the 35th Division was ordered out of Metz on the same day and at 8 a.m. on December 27th, we attacked through knee deep snow to the East of the Arlon Road, with the 137th Regiment on the left, the 320th Regiment to the right, followed the next day by the 134th Regiment which went into line to the left and West of the 137th Regiment. To our right was the 26th Division. 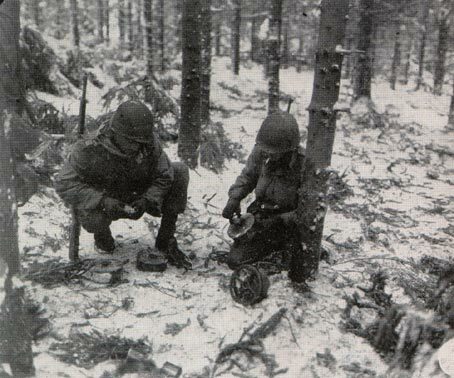 Our line of departure was about nine miles from Bastogne and for the next two weeks we learned the meaning of freezing in hell for we ran into some of the bitterest and most difficult fighting of the war, the most wintry with temperatures dipping below zero, and the costliest in terms of casualties. We attacked and so did the Germans, from assault to stalemate, from defense to counter-attack. Casualties were heavy on both sides, and men would be hit and fall and freeze to death before they could be gotten out. Corps men would have to keep blood plasma under their arms to keep it from freezing. Trench feet, frozen feet put men incapable of moving. We did not know that Hitler had ordered some of his best remaining troops to cut off the Third Army’s relief of Bastogne at all costs. Now across our front from our right came the elite 1st S.S. Panzer “Der Fuhrer” Division, sent down from the German Sixth Army to break us – the 167th Volksgrenadier Division, and the 5th Parachute Division from the Seventh German Army. Fighting see-sawed in and around towns like Lutrebois where we lost two companies of the 134th Regiment, Marvie, where we at last broke through to the 101st Airborne, Surre, Villers La Bonne where the 137th lost companies K and L, cut off and hit by the Germans with flame throwers, the survivors captured and marched into Germany to a prison camp, Boulaide, whose grateful citizens would welcome returning veterans in later years as tour groups, Tarchamps, and Harlange where a single farm, fortified, stopped the 320th Regiment. Frostbite, illness and exhaustion, the freezing waters of the Sure River, waste deep, waded across by the 320th soldiers. Deep snow which slowed attack and bogged down G.I.s who were unable to move fast enough to evade the lethal fire of enemy machine guns, mortars and artillery shells, tree bursts and craters. The fields and woods became graveyards littered with dozens of destroyed tanks and assault guns, half tracks, trucks, equipment, and corpses. We saw the Adolph Hitler Division die before us. By Maj. Norman C. Carey, Company A-320th Inf. Regt.